ecoparcel-delivery.com is a fake shipping company run by Romanian scammers. Always do your background work when dealing with online companies. The scammers running this site are posting ads for apartment rentals and asking for payments using MoneyGram. NEVER use MoneyGram or Western Union to pay for items on the internet. Once the money is picked up there is no way to get it back. Q:How can I pay for shipping services? A:At this time we only accept Money Gram and Western Union. This is because they are fraud. Ecoparcel provides the booking of delivery services for all types of users. Our services are for users who wants to send a parcel at the best price and for partners who want offer delivery services. 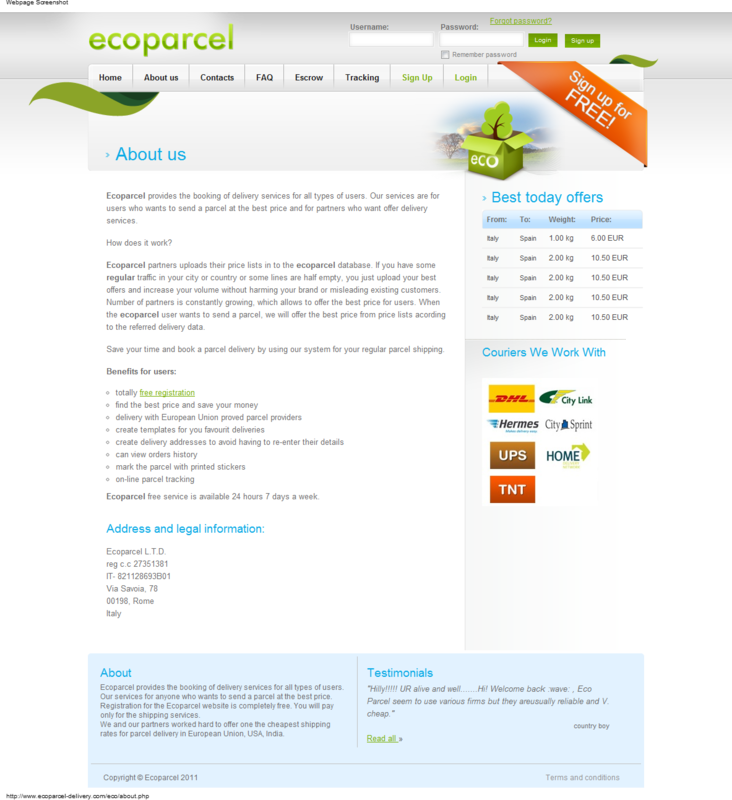 Ecoparcel partners uploads their price lists in to the ecoparcel database. If you have some regular traffic in your city or country or some lines are half empty, you just upload your best offers and increase your volume without harming your brand or misleading existing customers. Number of partners is constantly growing, which allows to offer the best price for users. When the ecoparcel user wants to send a parcel, we will offer the best price from price lists acording to the referred delivery data. Save your time and book a parcel delivery by using our system for your regular parcel shipping. 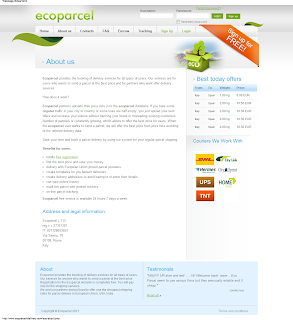 Ecoparcel free service is available 24 hours 7 days a week. 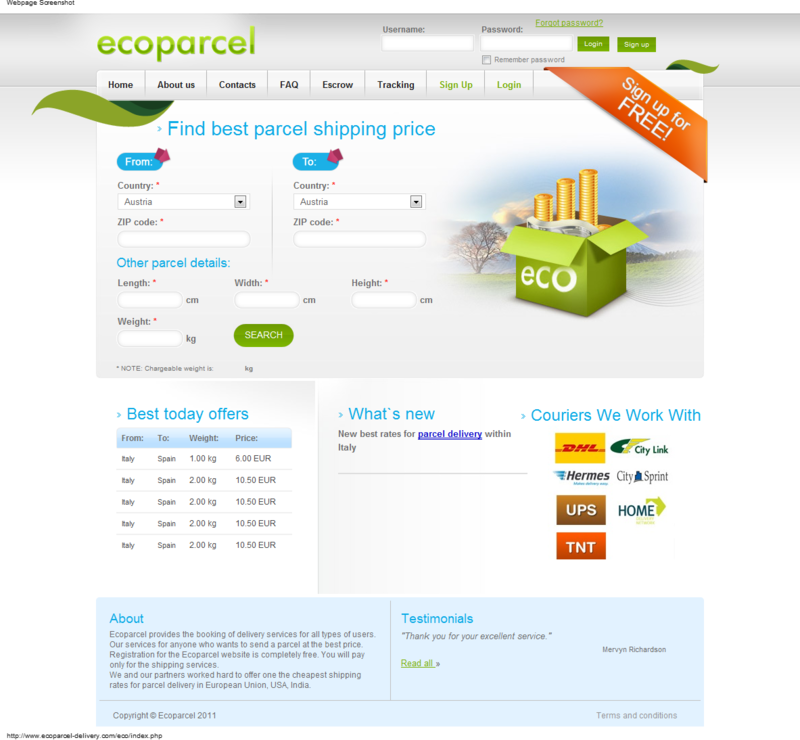 A:ecoparcel provides the booking of delivery services for all types of users. Our services for anyone who wants to send a parcel at the best price. 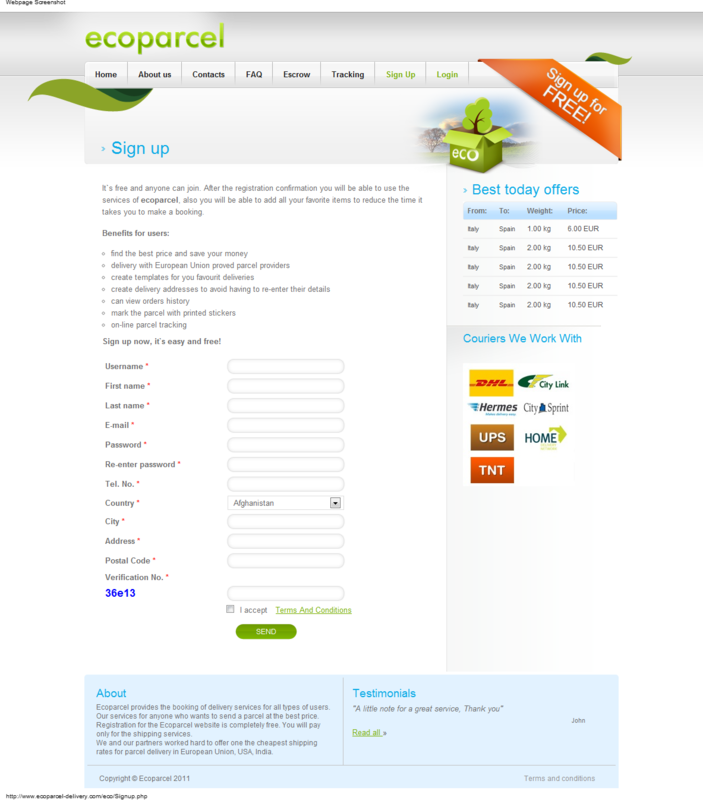 Q:How much does it cost registration for the ecoparcel website? 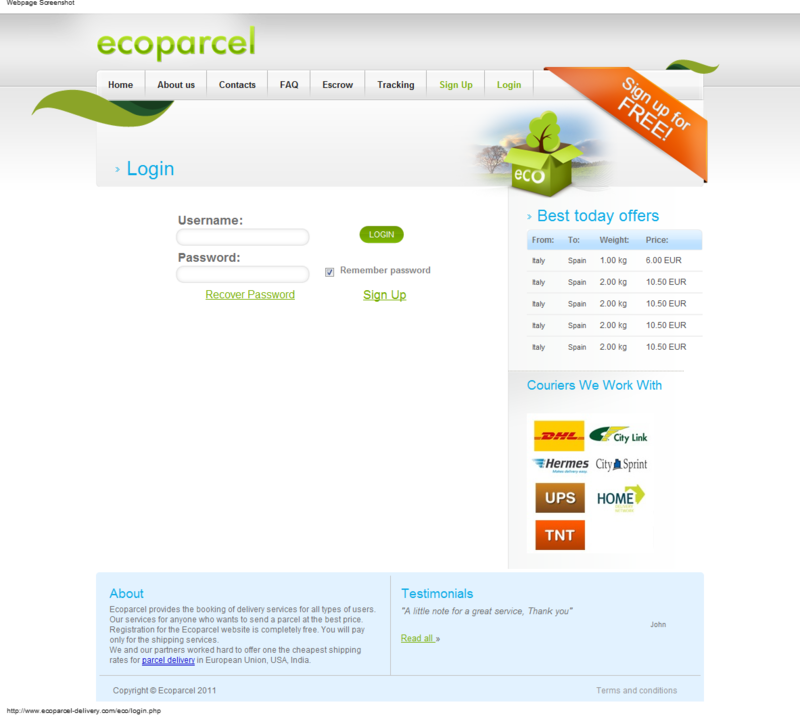 A:Registration for the ecoparcel website is completely free. You will pay only for the shipping services. Q:Where can I send a parcel? A:The parcels can be sent anywhere in Europe. Q:Will my parcels be fully insured? A:Standard insurance is 500 Euro per parcel. 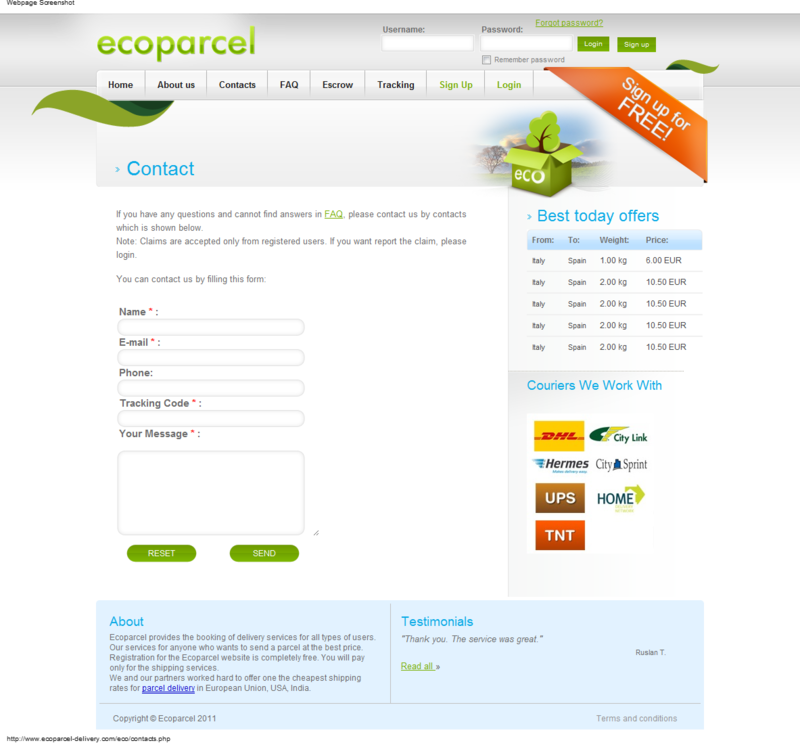 Please read "Official Ecoparcel terms and conditions". For escrow services any seller/renter has to purchase a 3000 Euro protection account. Q:Why you mixed up my parcels? Q:Why nobody came to pick up my parcel? Q:Why I did not receive e-mail confirmation after registration? A:Please check your spam filter as registration confirmations are sent automatically. If there is nothing in spam filter please write letter using this contact form below with subject "authorize manually"
Q:Where I can find parcel number? Q:How can I call you? 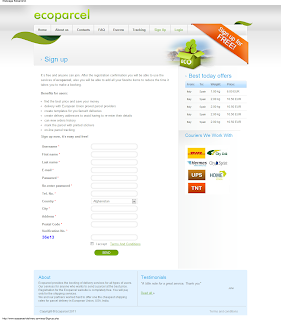 A:We are web based parcel company and offer economical and ecological business approach. There are two possibilities to contact us. 1. For NON parcel questions you can fill in contact form below. 2. For parcel questions you have to open ticket in contact page form and enter parcel number, this way you get in touch with partner directly. Q:Do you pick up parcel from my location? A:Yes, courier could arrive during all day to your address. Unfortunately it's not possible for a moment to specify exact delivery time. Q:When do you arrive to collect my parcel? A:If you place your order before 12:00 CET (Central European Time) courier arrive for pick up next day. Q:What kind of shipments you deliver? A:Mainly we deliver all kind (standard) of parcels and shipments from 1kg up to 10.000 kg. Parcels from 1 kg upto 50 kg must be packed properly to be handled by mechanical sorting conveyors. Shipments over 50 kg must be packed on pallet as you get one label ONLY. Q:What kind of goods does your escrow service cover? A:Our escrow service covers goods up to 5,000 EUR or equivalent. From laptops and phones to keys, you can buy or sell anything, and stay assured that you are protected. Q:Why I can't get price on your web site? A:If you enter right ZIP codes and you get message: We`re sorry, but currently there is no offers available for your query. It means we do not have valid offer for your query. 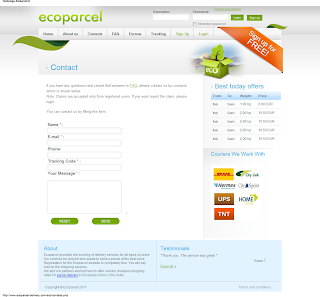 If you like to work with ECOPARCEL, you can offer your local service provider to join our system as partner and you will have your rates here. Q:Do you make special offer or disccount? A:We try to offer most competitive prices on market. Partners enter their best prices for special regions or special timings so extra discounts is not available at the moment. Q:How to cancel my order? A:If your order is not picked up yet, you can log in and push red cancel button next to your order. When canceled partner receive notifications and must confirm cancel. (Please note that partner can't confirm cancel if parcel already collected). After this you get short e-mail notification with instructions how to get refund. Q:Can I send dangerous goods (DGR) with you? A:No, we do not accept dangerous goods. If we find any dangerous goods in package (for some destinations parcels travel by air) parcel can be stopped for further investigation. Q:Why for some countries you ask 5 digits ZIP code when we have only 4 digits? A:In all EU we use standard 5 digits ZIP (postal) codes system (except in some countries like Austria, Ireland and few more). If you do not know for sure pick up or consignee ZIP code, we recommend check it with local post office website. If still you have different ZIP code and our website does not accept it, we recommend enter first digits what you have and maximum 1-2 last digits enter from "air" (as normally first digits define area). Real ZIP code which you know as good one please enter in comment field when you make booking. Q:Can I change pick up or delivery address after I placed order? A:You can not change order you sent. If your order details changed, you should cancel order one day prior to pick up date and place new order. Q:Can you pick up or deliver my parcel at specific time? A:Couriers and drivers deliver parcels and shipments all working day. There is no possibility at the moment to arrange special pick up or delivery. Q:Should I register as USER or as PARTNER or affiliate? A:If you have shipments for delivery, you have to register as USER, if you are transport or logistic company and would like to gain new customers - you have to register as PARTNER. 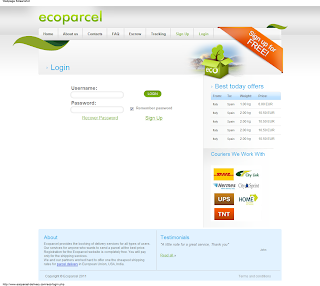 If you are USER and would like to promote ECOPARCEL services, you can register affiliate program and place our banner to your web site and get extra income. Q:I did not receive e-mail with labels for parcels. A:Labels are sent automatically, so you have to receive it within minute. If you did not receive first please check you 'spam' filter, second log in to your account and click My orders menu, select pick up date and print your labels. Q:Do you deliver parcel to the door? A:Yes, we deliver parcel to the door. Courier deliver parcel to address on your eco label. Q:How can I do to ship more than one parcel to the same consignee at the same time? A:You have to create new (another one) parcel, pay for it and book. At one time you can create just one parcel/shipment and receive one label. Q:What does it mean "Ticket closed" or "ticket open" on the status of one of my shipments? Q:Why I can find rate for my parcel? A:We have rates ONLY to destinations where our partners can offer. If you do not find rate you can try later or invite your local logistic provider to join our system and privide with rates. Q:How parcel must be packed? A:Parcels up to 50 kg must be packed properly to be handled by mechanical sorting conveyors and package must protect 40 cm drop. Shipments over 50 kg must be packed as one unit on pallet. If you sending suitcase it will serve as package or to protect suitcase we recommend to pack it additionally. Q:What do you do when consignee is absent? A:We try to deliver one more time and enter status on track and trace page as consignee not in. Q:Can I send parcel on Saturday? A:Parcel can be sent or received any day of the week. Our couriers work 24/7.